Have you ever just felt that you were in a situation that just wasn’t going to turn out right? I remember that moment, as an Oregon teenager, before our speeding car went over this cliff on a steep mountain road we were on and remember saying to myself, “oh oh”. We crashed – it was bad, but remarkably, we were OK. 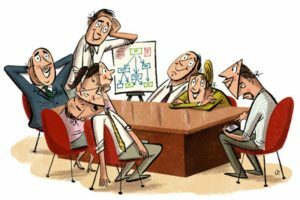 Recently I had a similar experience; I was asked to sit through a meeting, observe, and provide some feedback about my thoughts of what took place. I said OK as long as I didn’t have to do anything but watch. At the half way point in the meeting, I was about to go nuts and I remembered again that instance of time just before we went over the cliff. I just wanted out of the car and in this case out of the meeting. I had had enough of people watching and poking at their cell phones, enough of the leader trying to lead without informing any of us of the meeting objective or agenda. I had had enough of the negotiation occurring about what we should do today. I was done, I couldn’t sit there and watch this and watch people just be totally frustrated in their quiet passive fashion. It was like watching sheep follow the shepherd over the cliff. After I had come back into the room, I innocently started to joke around a little, asked some clarification questions, and tried to establish some rapport with the group. I refrained from commenting on or contributing substance or content to the discussion. My comments were intended to be perceived as innocent lines of inquiry that would help me understand what was happening and what the issues were. I was playing dumb. But, inside I knew what I was doing – I was providing leadership to a group that didn’t have real leadership. I was asking questions that provided clarity about what their project’s objective was. I was creating understanding about the need that was being addressed by this group. I was probing for the what their plan was to reach their goal. And, I was creating a conversation about why we are here today and what we needed to leave this meeting with? The group needed and was seeking this kind of clarity and their leader was not providing it. So, my questions brought out from the group the things that they were quietly hoping for and anticipating that they would hear but were not hearing. I felt guilty. Even if nobody else knew, I knew I was facilitating. I was leading. Was I manipulating the group for my sake? I hoped I wasn’t. I believed that everybody wanted that clarity. My only solace was this – I had stayed out of the content. I was leading the process by asking the questions; I was facilitating. Without it, the group would have floundered and they too would have labeled this meeting as another useless hour of time. Later, after the meeting, the responsible manager and I had a conversation in which she shared how impressed she was in how I had invisibly facilitated the last half of the meeting without personally getting into the content of the project itself. It was nice to hear that. She also shared her frustration about how meetings in general are managed at her company. Typically, meetings have no objective, they have no agenda, the leader acts passively, people arrive late and leave early, cell phones are on, computers are open, and people are “multi-tasking”. She went on to say that over the last month she had kept a log of her meeting attendance. Her data revealed that for the last four weeks, meetings per week were requiring on average 20 hours. The average number of people in the room for these meetings was 11 people. Ninety percent of the meetings started late, waiting on average for two people. Meetings typically ran late by 16 minutes. For her, that meant that she was late for adjacent meetings 40% of the time. Ninety percent of the meetings ended with the leaders suggesting that another meeting was needed. This person’s salary was $120,000 plus benefits per year. Her hourly rate equivalent was about $78.00 including the 35% benefits loading rate. So, that meant that she was being compensated $1,560 per week, $6,760 per month, $81,120 per year, to sit in meetings that began late, that ran long, that had no objective or agenda, that accomplished nothing, and that led to the scheduling of another meeting. In addition, she said that given the average meeting size of 11 people, she and the other 11 associates were, in total, getting paid just under a million dollars a year to sit in these useless meetings. She went on to say that there were probably at least 100 people at the corporate office who were experiencing meetings just like her. “So, the reason I asked you to observe that meeting the other day wasn’t just because we need help on that project,” she said to me. “We also have this huge latent loss of compensation that comes from ineffectively engaging people at work. Lack of good meeting planning and management is part of that lack of effective engagement. And, I believe, that alone is wasting several million dollars of our salary and benefits expenditures at corporate alone. Can you help us?” she asked. • 50% reduction in total meeting time and much improved outcomes. • Half million dollars in compensation not wasted in useless meetings that is now available for actually doing some work. • Project objectives being met more effectively and efficiently that each had their own ROI. The return on investment – invaluable! I’ve been in some of those meetings & ended up “leading from behind” (or alongside). It can be awkward in the moment, but serves those involved. I’m impressed by the way you were able to get permission, come in alongside, and debrief the experience. Thanks for sharing that!